I’ve been busy packing my bags. I got my clothes, rockies gear, toys, snacks, diapers and baseballs in hopes of getting an autograph or two. I’m heading out first thing tomorrow morning to Arizona, to catch my first Spring Training game. I wasn’t really sure what game to to go see tomorrow afternoon. There are just so many great teams, so close together. In the end, I’ve decided to check out the Angels vs. Brewers. I snagged some pretty good seats and decided to invite Mom, Dad, Pappy and Gran C to go with me. On Monday, we’re heading to Tucson to catch the Rockies vs. Angels. I can’t wait. I also got a nice return in the mail today from Padres pitcher Heath Bell. Dad helped me send this one out at the beginning of Spring Training and he sent it back quick. Thanks Mr. Bell! I’ll post again soon. Gotta go grab some zzz’s before my early flight. About two weeks ago, I got an e-mail from Don, the Rock Pile Ranter, to see if I’d be interested in going to the first ever Rockies Fan Fest. I jumped at the chance! Don put Dad in touch with Dan, a Rockies season ticket holder and familiar face during batting practice. Dan was kind enough to give us a pair of tickets for the big day. Dan and Don, thanks so much! We really appreciate it. When we got inside, we set off on a self guided tour through the tunnels under Coors Field. I cruise in style. I got shuttled around in my stroller. It’s really the only way to travel. Our first stop was at the humidor. Unfortunately, it was locked up tight for next season. From there, we wandered over to the batting cages. I think I could do some serious damage in here. I spotted some fancy hardware from several players including Matt Herges and Jeff Baker. Next, we headed to the Rockies dugout. It was great to walk around in there. I could almost smell the pine tar and hear the cracking of sunflower seeds. I got Dad to give me a few pointers. These are without a doubt, the best seats in the house. Down the hall from the dugout is the clubhouse. These guys have it all figured out. A big kitchen, comfy chairs, fancy smelling soaps and soft towels. They even had big old TV’s for watching Sesame Street before the game. I think I could get use to it. Mom tracked down the lockers of some of my favorite players. Here’s Todd Helton. One more for you. This one belongs to Troy Tulowitzki. Dad thought he spotted a Cal Ripken Jr. bobblehead on the shelf. After checking out all the lockers, we headed down the hall to see where broken players go to get fixed. I tried to get Dad to give me a massage. Being a baby can be a stressful job at times. They also had hot tubs and cold tubs and other weird things to make you feel better. We made our way out of there and came across a room full of Rockies memorabilia and things from historic games. They had game used pitching rubbers, bases, bats and pretty artwork. I had Mom take pictures of a few items in there. Here are some jerseys from Iannetta’s and Tulo’s MLB Debuts. Here’s a shot at one of the National League Championship rings. Eventually, we made our way up to the Club Level and when we got there, we ran into Dan. He told me that Brad Hawpe was reading stories for kids, so I decided to make that my next stop. When we got there, he was wrapping up, but I decided to try my luck at getting an autograph. I was holding my World Series baseball that I’ve been getting signed by the ’07 team. Brad came over and tried to take my ball from me. He and Dad were both trying to pry it out of my hands, but I wasn’t having it. I worked hard for that ball and I wasn’t going to let them take it from me. I was grunting and holding on with all my might. Brad thought it was pretty funny and decided to just move my fingers out of the way in order to sign my ball. Brad, if you’re reading this, I just want to apologize for not giving you my ball to sign. I’m kind of attached to it and don’t want to lose. Thanks for understanding and being nice enough to still sign it for me. Next up on our agenda was an interview session. Dan scheduled us to sit in on an interview with the infielders. They answered all kinds of things from an update on Todd’s back injury to what ballparks they like to play in when they’re on the road. They even went on about the 4th of July home run derby to the 22 inning marathon that took place in San Diego last season. It was really interesting. While I was sitting there, I got to thinking about the upcoming season. I really think we have one of the best group of infielders in all of baseball. I think know we’re going to do great this year. After the interviews, we got in line for our autograph session. I didn’t know who was going to sign for us, but I had a few players in particular I was hoping to meet. Fortunately, I’m a super lucky baby, becuase my autograph session was with Mr. Todd Helton, who was at the top of my list. However, my experience was a little strange. It was one of those moments you read about when people meet their heroes and they can’t speak and sometimes even break down in tears. I cried more than a little school girl watching the Beatles arrive in America. I’m not sure what that means exactly, but that’s what Dad told me. What I do know is that my mind went blank. When I finally came around, I was in Dad’s arms with tears running down my face and I was holding a shiny, new baseball. What had happened to me? How had I gotten here? Thank you Mr. Helton. It was really nice of you to sign my baseball. I hope I don’t freak out the next time we meet. We did a little more wandering around. I wanted to show the other teams, especially those pesky Diamondbacks, what I thought of them, so I slept through my tour of the visitor’s clubhouse. HAHA. Take that you non-Rockies. We also saw the owner’s suite, the press boxes and just about any other place they let me explore. I got a few autographs and saw players walking all over the place. Dad almost got ran over by Jeff Francis, Mom flirted with one of the new guys, Greg Smith and I waved at my buddy Chris Iannetta. It was a pretty amazing day. Here’s my Todd Helton ball. I also talked Dad into buying a ball signed by the 2006 team. As we headed out, the ushers waved goodbye and told me they’d see me on opening day. I sure hope so. Uhm, Dad, that’s a hint. Mom says you don’t take hints well, so I’m spelling it out for you. I’m so ready for Spring Training. What a day! Thanks so much to Dan and Don. You guys rock! We really appreciate the tickets. Without you guys, Dad would have been stuck going to work and I would have resorted to watching reruns on the MLB Network. Thanks again! Also, thanks to the Rockies and the staff at Coors Field. You guys know how to throw a party. I really hope to see you in a few months for the 2009 season. I’m having a pretty sweet week. Mom told me tonight that Grandma and Grandpa Goodrich might be renting a house for a few weeks this spring in Florida. Anybody know what happens in Florida during the spring? Anybody? Anybody? How about Spring Training! 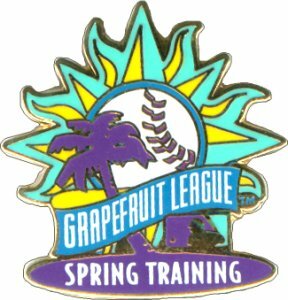 That’s right, the Grapefruit League will be going strong at the same time that they’ll be in Florida. Not only that, but they’re going to be staying in Port Charlotte. That’s where the 2008 AL Champion Tampa Bay Rays will be calling home for Spring Training! They’ve even got a brand new stadium in the works. I love me some Rays!!! But wait, there’s more! Gran C and Pappy told me a few weeks ago that they want to go with me to catch some games in Arizona. Any guesses as to who’ll be in Arizona this spring??? Hmmm??? That’s right, the Rockies!!! 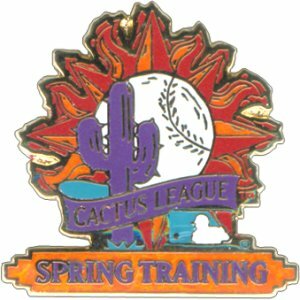 The Rockies will be in Tucson as part of the Cactus League. Needless to say, I’m pretty psyched. I mean, could it get any better? Spoiled by Grandma and Grandpa and the chance to catch some great baseball games. I’m a pretty lucky baby. I’ve also got two special events coming up over the next couple of weekends. Stay tuned for all the details. Looks like another Rockie is set to play on Team USA in the upcoming World Baseball Classic. Brad Hawpe announced today that he accepted his invitation. It’s good to see Brad and Chris getting the recognition they deserve. I’m still rockin’ with the MLB Network. It’s pretty perfect if you ask me. Anyway, Tim Lincecum is going to be on the Hot Stove show tonight. Even though he’s not a Rockie, he’s one of my favorite players. I always cheer for him unless he’s playing my Rockies! I’m looking forward to hearing what he has to say about winning the Cy Young Award and what he’s been doing during the offseason. Maybe he’ll even throw some pitches in Studio 42! Check him out. In case you missed it, I was on the MLBlog homepage again last week. They had my smiling face up there with some other great guys including Joe Torre, Mark DeRosa and local favorite Don (the Rock Pile Ranter). Here’s a screenshot. We headed back to the ballpark on Tuesday to catch another round against the Padres. We managed to get to the game early again to take in batting practice. Dad met some of the regular ballhawks and finally met up with Don, who writes the Rock Pile Rant, which we both enjoy reading. Check it out if you haven’t already. Dad got Jeff Francis to throw us a ball. It was a little dirty, but I think it just adds to the flavor. I love chewing on my baseballs. I snapped this picture when I heard the guys talking about me. I think they were hoping to get mentioned in my blog. Jeff Baker was asking if his hair looked OK. He could probably see me taking pictures to post online. It’s OK Jeff, I don’t even have hair yet. Anyway, on to the game. It was Ubaldo Jiminez’s turn on the mound and I knew he would be able to take care of things. I know he’s a Padre, but I like all-star Adrian Gonzalez. I got Dad to snap a picture because I think he’s a good player, not to mention I caught a ball from him earlier this season. It was my lucky night and I got to see another grand slam. This time it was from Chris Iannetta. Way to go Chris! I learned how to clap this week so I was able to yell AND clap for Chris. Lots of K’s on the board tonight. Way to go guys! It was good to see them pull out a 10-3 win after the spanking we took last night. Before I wrap this up, I want to congratulate Zack, who managed to snag home run balls at back to back games this week. He caught them at Yankee Stadium. It’s the final week for Yankee Stadium and he was spotlighted on SportsCenter and Baseball Tonight. Both come on past my bed time, but his website had some great videos of his catches. Also, I got my very first piece of mail this week. Actually, I got two things in the mail. I’ll tell you about them in an upcoming post, but I’ll just say one came from one of my favorite Rockies and the other came from last years World Series Champions. Stay tuned and thanks for reading!